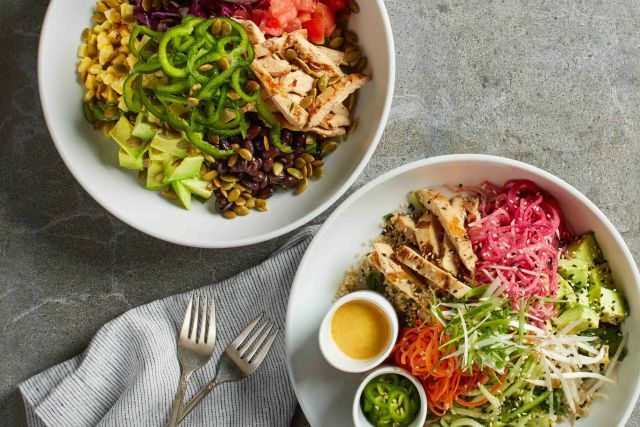 California Pizza Kitchen ushers in this summer with a number of seasonal menu items including the new Banh Mi Bowl. The Banh Mi Bowl is a bit like a Vietnamese banh mi sandwich but without the bread and features quinoa, baby kale, grilled chicken, watermelon radishes, avocado, cucumbers, carrots, bean sprouts, scallions, cilantro, mint, sesame seeds, serrano peppers, and a chili-lime vinaigrette. - Santa Fe Bowl - Cilantro farro, spinach, lime chicken, tomatoes, sweet corn, black beans, red cabbage, avocado, poblano peppers, and toasted pepitas served with poblano ranch dressing. - Lemongrass Chicken - Roasted chicken in a lemongrass ginger glaze served over stir-fried baby bok choy, roasted farro, Shiitake mushrooms, and red chili. - California Fields Salad - Fresh watermelon, strawberries, and field greens with Champagne vinaigrette, feta, and pistachios. - Strawberry Shortcake - Shortcake biscuit topped with fresh strawberries, whipped cream, and candied lemon zest. - Watermelon Mint Martini - Bombay Sapphire Gin muddled with fresh mint, watermelon puree and agave sour. - Carne Asada Pizza - Topped with Marinated steak, fire-roasted poblanos, cilantro pesto, yellow onions, Mozzarella, Monterey Jack, and fresh cilantro. Served with salsa verde. - Wild Mushroom Strozzapreti - Rolled pasta noodles with sautéed Cremini, Portobello and seasonal mushrooms, Parmesan, and fresh thyme and parsley. - Charred Shishito Peppers - Shishito peppers sautéed with Tamari soy sauce, garlic, and red chili. - Socialite Cosmo - Deep Eddy Ruby Red Grapefruit Vodka shaken with Pavan Liqueur, cranberry juice, and fresh agave sour. - Passion Fruit Mango Iced Tea - Unsweetened iced tea with a blend of passion fruit and mango flavors. - Cucumber Reviver - Pureed pineapple and cucumber with Monin Cucumber, torn mint, and agave sour, topped with club soda.